My church, Immaculate Conception Catholic Church, located on Seventh Street and Avenue C, is where I received all of my holy sacraments. It still stands today, and it’s not even a block away from my home. I could walk to it in two minutes. It is a normal sized church constructed of bricks. A huge glass triangle sits off to the right of the structure. Further to the right is a cast iron fence. If you peep through the vines that cover it, you can see the priests relaxing on a well-flourished garden patio. They live in the building to the far-most right of the structure. To the far-most left, there is a little shrine with an iron door attached to it with windows on all sides covered with iron bars. One would go inside to light votive candles or prayer candles for the soul of a deceased love one or a sick person. If you choose to light a candle, you give yourself up to God, and pray for your intention. Above the prayer candles is the statue of St. Lucy holding a dish of eye balls. In religion class when I was very young, we went to visit the shrine and I vividly remember seeing the statue of St. Lucy for the first time. I couldn’t help but stare at her and I always felt like the eyeballs in the dish were staring at me. The front doors of the church are made of glass. There are two angels facing each other on the doors and the handles are heavy bricks of gold. If you look down the main aisle, you can see the triangular shaped tabernacle sitting on the altar towards the back of the church. To your immediate left, there is an intricately designed heavy glass bowl of holy water. Whoever enters the church must dip their hand in it and make the sign of the cross over their forehead. The main aisle is made of old white terrazzo speckled flooring and above the altar is a giant crucifix of Jesus. Behind him there is an even bigger collage of thick colorful stained glass. When the sun shines through, it displays an arrangement of colors on the floor of the church. To the right and left of the main aisle are medium brown wooden church pews. The columns on the far right and left of the pews depict the Stations of the Cross and to the far right the walls of the church are made up of multiple stained glass windows with a different saint on each of them. What I remember most vividly are the light fixtures. They are long octagon lanterns trimmed in gold metal attached to the ceiling by a gold chain. The light they illuminate was always dim and yellow. As a child I would sit in the church pew, and I could never see the altar until I went up to receive a blessing from the priest during Communion. In the mean time I would just look up to the ceiling and study the light fixtures to keep myself occupied. When I was young, my parents took my brother and me to eight o’clock mass every Sunday. When we lived on Alison Drive in Gretna, my mom dressed us in our “Sunday’s best” clothes. She would load us up in outdated white Nissan Maximus that smelled bad in the backseat because little Vinnie had spilled milk all over the seat one morning when my mom stopped at Coffee & to get us doughnut holes for breakfast and decided to not say anything until we got to school. My mom, brother, and I always sat ready in the car waiting for my dad. He was never ready, ever. 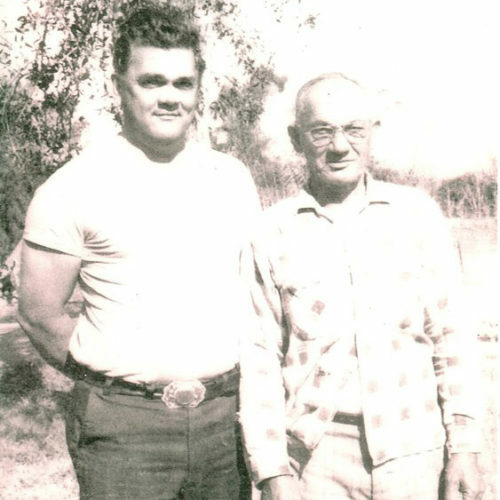 Vincent Leco Sr. with his grandfather Pierre “Pete” Leco. My mom yelled at him out the passenger window from the driver’s seat. “Hurry up Vinnie! We’re going to be late! You always do this.” He swung himself into the small car making this funny noise that I wish I could describe or mimic, but can’t. He always made these little weird noises to try to be funny. He rarely got frustrated and most of the time was in a good mood. As my mother drove, he held onto the grey plastic handle piece above the window ready to jump out. He was too big for the small car. He always seemed smooshed. We never ate breakfast before church because my dad said we couldn’t. We had to wait until after church because we had to fast until we got communion. This logic doesn’t make sense to me now because we weren’t old enough to receive communion. He probably just didn’t want us to complain about being hungry in church. One of the main moral teachings my parents instilled in my brother and I was to love everyone despite race, religion, culture, personality, where a person was from, or what a person did. We were not allowed to judge people based on material wealth. We were taught to never judge others at all. We were taught to love everyone. We were taught to turn the other cheek when others treated us unfairly. It was our job to always be kind. We were taught to be just. There were many times I had a difficult time turning the other cheek when people were mean to me. I wanted to retaliate, but most of the time I didn’t.